When you’re deciding on how to improve your heart’s condition, ‘be a part of the solution not part of the pollution’ and don’t get trapped by ‘10 myths about heart disease’, as recently advised in Harvard Health Letters. Dr. Allen’s Device for Heart Treatment is an effective natural solution for ischemic heart disease that helps to strengthen heart muscle and treat coronary heart disease at the capillary level, states Fine Treatment. Dr. Allen’s device for ischemic heart disease suits both men and women. This soft cotton vest is designed to keep the natural thermo-element applied to the heart area over time comfortably. The first myth, according to The Harvard Health Letters ‘10 myths about heart disease’, in Chicago Tribune of July 31, 2013, is: ‘If you have heart disease, you need to take it easy.’ “For the vast majority of people with heart disease, being sedentary is a bad idea. It can lead to blood clots in the legs and a decline in overall physical condition,” says cardiologist Dr. Richard T. Lee, co-editor in chief of The Harvard Heart Letter. Physical activity helps strengthen the heart muscle, improves blood flow to the brain and internal organs, and improves overall health and well-being. Fine Treatment highlights that Thermobalancing therapy is beneficial for ischemic heart disease, provides angina relief and strengthens the heart muscle, assisting in the recovery after a heart attack. 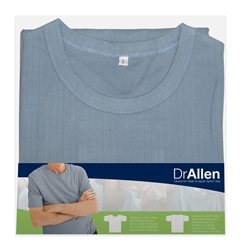 Dr. Allen’s Device for heart treatment increases the blood flow in the coronary arteries improving the condition of the heart muscle and relieving disturbing symptoms. It is designed as a cotton vest with the thermo-element, and comes in different sizes – from Small to X-large – to fit men and women comfortably. Oxford Innovation has interviewed patients who have used the Thermobalancing therapy. The following video, for instance, discusses the treatment of coronary heart disease with Dr. Allen’s therapeutic device: http://www.youtube.com/watch?v=Zr2euPQYztQ. Another common myth revealed in the article is that ‘heart disease is really a man's problem’. Since 1984, more women than men have died each year from heart disease. Heart disease is the leading cause of death in women over age 65, just as it's the leading killer of men. By retirement, 70% of men and women have cardiovascular disease, which includes coronary artery disease, heart failure, stroke and hypertension. Risk continues to rise, and by age 80, 83% of men and an even higher percentage of women – 87% – are affected. For details, please visit Fine Treatment at http://finetreatment.com/coronary-heart-disease-treatment-angina-relief/.